Countless hours and millions of dollars went into redesigning the new nutrition label, yet it is already being called a failure. Why? It isn’t the amount of work that went into it. It is that the label was designed by researchers and scientists for rational people. I don’t know about you – but food is one thing that I don’t think about rationally. And, I once worked as the strategic lead on obesity for the American Heart Association! Social sector organizations are using human-centered design to uncover challenges and opportunities (or, as we like to say – “Fall in love with the problem and not the solution”) in clients’ lives. A simple way to do this is to have staffers shadow a small number of clients and record observations about the hurdles they face. Remember to ask the right questions to truly understand clients and dive deep by using process, such as root cause analysis. Themes will emerge that may be surprising. For example, Save the Children observed mothers preparing meals for their families to find out why some children were well nourished while others were not. They spread insights from their observations throughout the community to improve overall health. Across the U.S., teachers are also talking to students to improve the classroom experience. Social sector organizations are following lean startup principles and looking to best practices and fellow providers for solutions that work for clients. IDEO, a human-centered design pioneer, also suggests looking for solutions in unexpected industries or situations and involving diverse members on your team. When the Food Bank for New York City tried to increase the number and speed of food boxes it prepared and delivered, it took cues from car manufacturer Toyota to start an assembly line and pack food boxes more efficiently. By using a solution that worked for car manufacturing, the food bank fed 400 more families in half the time. 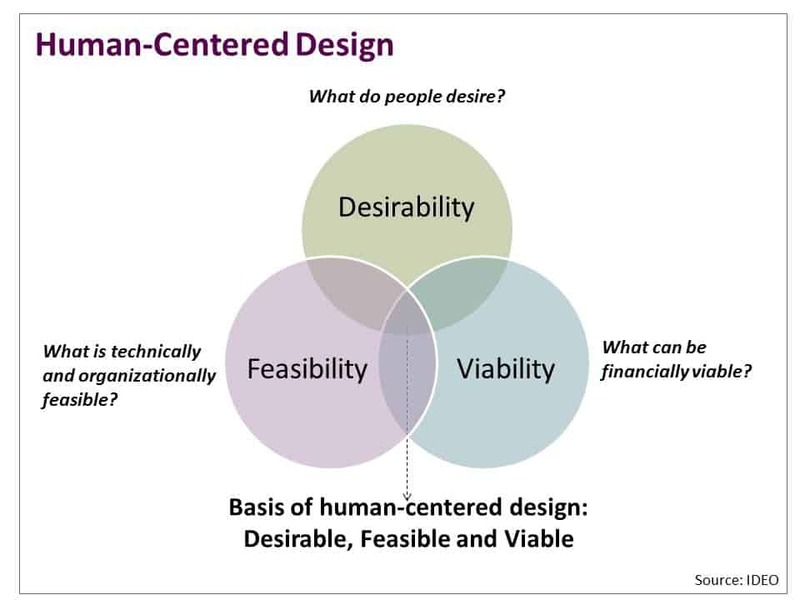 Social sector organizations can also use human-centered design to bring ideas to life through experimentation and reiteration. Using models, simulations and renderings to develop a prototype or first draft of your team’s proposed solutions can generate more ideas on how to improve your final product. The Empowerment Plan in Detroit embraced human-centered design and created a prototype of a jacket for the homeless. By asking homeless people for feedback on prototypes, the organization improved the initial product by transforming the jacket into a convertible sleeping bag. The company eventually evolved to give homeless individuals what they really needed – jobs – by hiring them to make the jackets. This only happened because the organization’s process included repeatedly asking for feedback, which resulted in design changes that improved their product. We hope these human-centered design resources spark your creative juices to make clients’ dreams a reality as you design new programs this summer. We also encourage you to reach out to your local colleges and universities to find students studying design thinking to help. For more inspiration, check out what my colleagues at SMU accomplished during their one-day design challenge on food deserts in South Dallas. We hope you will share your design-thinking success stories and the principles you used to make them happen. Great post Suzanne – The Design, Test, Refine, Repeat model follows the core principles behind Lean Startup methodologies, which are great methods for social good organizations to adopt – especially those on a budget!